This site provides the full collection of the 22 Battalion War Diaries. There are over 3,000 page images here representing 92 individual files, from January 1940 to August 1947. The Diaries are reproduced with the written permission of Archives New Zealand Te Rua Mahara o te Kawakatanga. The Diaries have been indexed by surname. Click here to go to the Index. 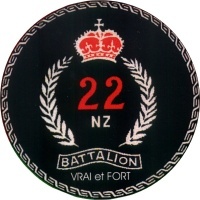 The 22nd Battalion was disbanded on 7 August 1947 when it became 2nd Battalion NZ Army.